Today, nearly every major league baseball team employs at least one quantitative analyst. The same is true of many professional football and basketball teams. This is still a new approach for sports teams, and most are generally behind businesses in their sophistication and use of analytics. 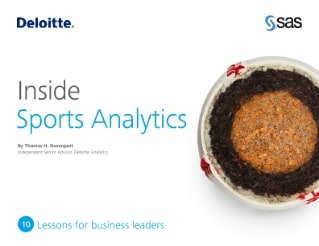 Yet there are important lessons that businesses can learn from the use of analytics in sports. Read about 10 of these lessons that Thomas H. Davenport, Independent Senior Advisor for Deloitte Analytics, uncovered in research conducted on more than 25 professional teams.